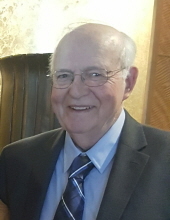 Russell Vincent Hayden Sr., age 76 passed away at Mercy Hospital of Folsom on Friday, January 25, 2019. Born August 14, 1942 in Oakland, California, he resided in the Northern California cities of Oakland, San Lorenzo, Castro Valley, Brentwood, El Dorado Hills and his final resting place Folsom. He worked for Sherwin-Williams Paint Company, The Oakland Tribune and Johnson Controls at Lawrence Livermore Laboratory until his retirement in 2004. The son of Edger and Sarah, survivors include his wife of 54 years, Dorothy, sons Russell Jr., Paul, Nicholas, sister-in-law Nancy, daughter-in-laws Jamie and Michelle, and grandchildren Zachary, Xavier, Yasmin, Samantha and Madeline. Services will be held at 11:00 a.m., on Sunday, February 3, at the Lakeside Memorial Lawn Cemetery, 1201 Forrest Street, Folsom, CA 95630. Relatives and friends are welcome at the service and reception. The reception will be held at Paul Hayden’s house, 341 Stagestop Ct, El Dorado Hills, CA 95762 gate code #7084. Please use the Evite link provided to RSVP for reception only. Flowers can be sent to the Miller Funeral Home at 507 Scott Street, Folsom, CA 95630 or in lieu of flowers contributions are welcome to the Yosemite Conservancy, 101 Montgomery Street, Suite 1700, San Francisco, CA 94104. To send flowers or a remembrance gift to the family of Russell V. Hayden, please visit our Tribute Store. "Email Address" would like to share the life celebration of Russell V. Hayden. Click on the "link" to go to share a favorite memory or leave a condolence message for the family.